Theresa May has been challenged to explain alleged Tory links to firms at the centre of a dispute over the harvesting and use of personal data. 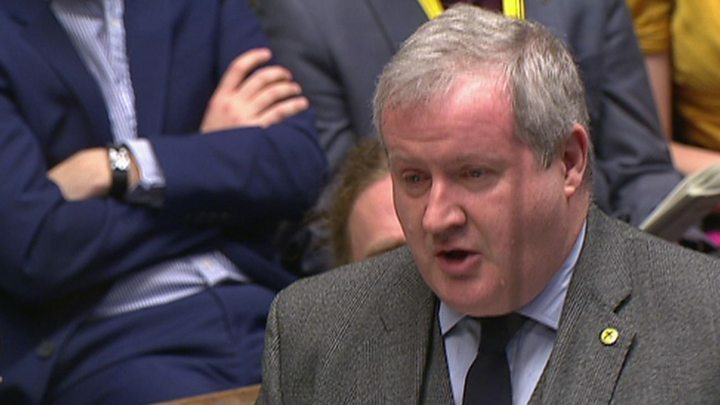 The SNP's Ian Blackford said SCL, the parent company of Cambridge Analytica, has been run by a chairman of Oxford Conservative Association. He also claimed its founding chairman was a former Tory MP and a director had donated over £700,000 to the party. The PM said she was not aware of any current contracts with the firms. The prime minister's official spokesman later said that three government departments had had contracts with the SCL Group in the past. Political consulting firm Cambridge Analytica is facing questions over whether it used the personal data of millions of Facebook users to sway the outcome of the US 2016 presidential election and the UK Brexit referendum. The company has suspended its CEO, Alexander Nix, who was filmed as part of a Channel 4 investigation giving examples of how the firm could swing elections around the world with underhand tactics such as smear campaigns and honey traps. Facebook founder Mark Zuckerberg has admitted the company "made mistakes" in its dealings with Cambridge Analytica and a "breach of trust" had occurred between the social media giant and its users. In a statement, he promised to strengthen the way users' data is protected to prevent "harvesting". And he said app developers that misused personally identifiable information would be banned from accessing the platform. 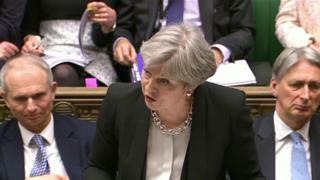 Media captionBlackford: Tory links to Cambridge Analytica go "on and on"
At Prime Minister's Questions on Wednesday, Mr Blackford, the SNP's Westminster leader, raised the issue saying links between the Conservative Party and SCL - Strategic Communications Laboratories - the parent company of Cambridge Analytica, "go on and on". He told MPs SCL "has been run by a chairman of Oxford Conservative Association", and added: "It's founding chairman was a former Conservative MP - a director appears to have donated over £700,000 to the Tory party. "A former Conservative party treasurer is a shareholder. We know about the links to the Conservative party - they go on and on." He asked Theresa May to confirm to the Commons "your government's connections to the company". The PM replied that allegations concerning the two firms were "clearly very concerning". "As far as I'm aware, the government has no current contracts with Cambridge Analytica or with the SCL group," she said. "It's absolutely right that they are properly investigated and the information commissioner is doing exactly that. "People need to have confidence in how their personal data is being used. I would expect Facebook, Cambridge Analytica and all organisations involved to comply fully with the investigation that's taking place." She added that a bill is being brought forward on data protection that will give tougher powers to the Information Commissioner's Office - which scrutinises the use of the public's private data for political purposes - to ensure organisations comply. Asked whether government departments have had contracts with the SCL group, the prime minister's official spokesman said there had been three. These were a Ministry of Defence data project in 2014-2015 - when there was a Conservative-Lib Dem coalition government - plus a Home Office training project and a Foreign Office communications project in during Gordon Brown's Labour government. A Conservative party spokesman said: "The Conservative Party has never employed Cambridge Analytica, or its parent company, nor used their services." Cambridge Analytica, along with Facebook, is under scrutiny following claims by a whistleblower, Christopher Wylie, who worked with Cambridge Analytica, a London-based firm. He alleges it amassed large amounts of data through a personality quiz on Facebook called This is Your Digital Life. Mr Wylie says that data was sold to Cambridge Analytica, which then used it to psychologically profile people and deliver pro-Trump material to them, with a view to influencing the outcome of the 2016 presidential election.